Fancy turning this down | Be Kind. We're all in this together. Paul McCartney and John Lennon went at each other viciously in 1971. Paul released Too Many People and Dear Boy on Ram, both aimed at Lennon. John responded by recording the burning How Do You Sleep? Around Christmas John was feeling a bit nostalgic about his old mate. On January 1 1962 the Beatles with Pete Best laid down 15 tracks in a London Studio as an audition for Decca Records. Decca made one of the biggest mistakes in the history of rock when they passed on the Beatles. 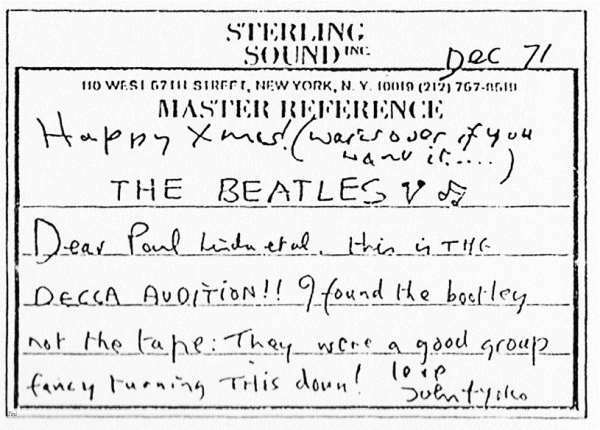 In 1971, John got a hold of a bootleg containing music the Beatles recorded on New Year’s Day 1962 for Decca, and sent a copy off to Paul and Linda as a Christmas gift. Dear Paul Linda et al. this is THE DECCA AUDITION!! They were a good group fancy turning THIS down! Have a listen to the Beatles’s Decca audition. Happy Christmas. War is over. If you want it. This entry was posted in Uncategorized and tagged Beatles Decca audition, John Lennon, Paul McCartney, The Beatles. Bookmark the permalink.